The evolution of South Korea's mobile networks from 4G to 5G is well underway, boosted in part by the forthcoming 2018 Pyeongchang Winter Olympics and the nation's plan to complete a dedicated nationwide public safety LTE network by 2017. Last Fall the Netmanias tech blog published an excellent description by two tech experts of the new network architecture that is envisioned. The article has some excellent diagrams, and I particularly liked the one shown here (click for a full size version). 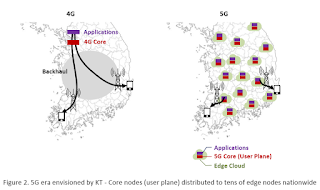 It shows that 5G will involve the distribution of core nodes to tens of edge nodes nationwide, as compared to a couple of core nodes in Seoul for the 4G mobile network. This change is dictated by the projected increase in volume of video and ultra real-time services such as real-time remote control and automatically controlled automobiles. Such services, and others require very low end-to-end delays.